Meta-analyses do fairly well at correctly stating their conclusions. Meta-analyses are quantitative literature reviews that combine results from across studies, essentially increasing the sample size and breadth. For example, Schoenfeld and Ioannadis looked at 9 meta-analyses showing an association between consuming particular foods (I think of foods such as fruits and vegetables) and reduced risk of cancer. For all 9, the results were statistically significant at conventional levels (p<.05). Schoenfeld and Ioannadis looked at 4 meta-analyses showing an association between consuming particular foods (I think of foods such as processed meats) and increased risk of cancer. For 3 of the 4, the results were statistically significant at conventional levels (p<.05). While the meta-analyses did well at reporting results, individual studies sometimes report results in their abstracts even when they were not statistically significant. Some of these reported results may be attributed to random happenstance rather than real cancer effects. This is why it is unwise to change eating habits with every new study. It is wiser to rely on the balance of scientific evidence connecting particular foods to cancer risks and benefits. Based on these results, you may be interested in the excellent collections of meta-analyses and systematic literature reviews available from a well-respected source such as the World Cancer Research Fund and the American Institute of Cancer Research. The new paper by Schoenfeld and Ioannadis reflects fairly well on the type of research posted by the WCRF and AICR. But, journalists will report the conclusions of the new study to say something completely different from the above. In the endless search for novelty, journalists write each day that everything you previously believed about diet and health is mistaken. For example, Sarah Kliff at the Washington Post's Wonkblog writes today under the headline: "Pretty much everything you eat is associated with cancer. Don’t worry about it." Food industry public relations folks will love this message. Don’t panic yet, though: The vast majority of those studies, Schoenfeld and Ioannidis found, showed really weak associations between the ingredient at hand and cancer risk. A full 80 percent of the studies had shown statistical relationships that were “weak or nominally significant,” as measured by the study’s P-values. This description seems to ignore the meta-analyses and also it seems to describe perfectly fine statistically significant results (p<.05) as if they were "weak or nominally significant." As with climate change skepticism, people twist genuine heterogeneity in scientific results to cast doubt on both marginal claims and widely accepted claims alike. I wish that neither journalists nor authors would cavalierly say that most of the literature is wrong, when even the new study shows quite trustworthy results for the authoritative meta-analyses that actually merit attention from the public. Just for example, the balance of scientific evidence from WCRF and AICR suggests that fruits and vegetables reduce risk and that red meats and processed meats increase risks of certain cancers. Such conclusions based on meta-analyses fare well in the new AJCN study. The federal government's semi-public checkoff programs collect mandatory assessments from producers. Of course, it is illegal to use these funds for lobbying. Pork Alliance dues are used to fund outreach for critical legislative and regulatory industry priorities, including foreign trade access, environment, food safety and animal welfare issues. The dues mentioned in the web page are large. The application form (.pdf) on the NPPC website says that the dues for becoming an "Alliance Partner" are $20,000. I am not surprised that the Humane Society of the United States (HSUS) has filed a legal complaint with the USDA Inspector General. The mandatory assessments are being funneled to a lobbying organization. No matter what you think of the HSUS, it seems wrong for the federal government to use its power of taxation to place a finger on the scale of the public debate. The Department of Justice has dropped its anti-trust case against Monsanto for anti-competitive behavior in the seed market. The company is very happy. Here is the American Anti-trust Institute's 2009 summary of the leading competition concerns (Update 12/2/2012: AAI receives support from DuPont, a Monsanto competitor), Monsanto's 2009 response (.pdf), and a 2010 article in Choices Magazine by agricultural economist GianCarlo Moschini. From Evan Fraser at the University of Guelph, a nicely balanced 12-minute lecture on the global food prospect. I like the choice of 4 solution strategies, including both high-tech solutions and local food systems without exaggerating the strengths of either. 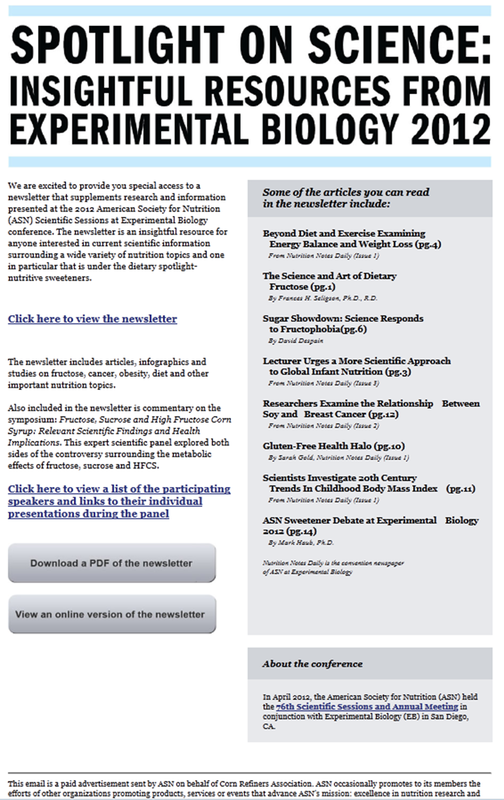 From nutrition scientists "on behalf of Corn Refiners Association"
Here is a newsletter I received today from an email account labeled oddly: "ASN on behalf of Corn Refiners Association." Follow the link for the full web version of the email. The ASN is of course the American Society for Nutrition. "Experimental Biology 2012" is the most important annual meeting for nutrition scientists. This email is a paid advertisement sent by ASN on behalf of Corn Refiners Association. ASN occasionally promotes to its members the efforts of other organizations promoting products, services or events that advance ASN's mission: excellence in nutrition research and practice. ASN never releases members' email addresses to any third party. While this footer to the email discloses the advertisement, the newsletter's .pdf file from the link does not mention that it is an advertisement. Clearly, the whole package is designed to look like a newsletter from a scientific association. In the gentlest way, the newsletter defends fructose and corn sweeteners from criticism. Does this type of advertisement cost the scientific association much in terms of independent authority and reputation? For many years, advocates for farmers have been concerned about production contracts in the poultry, pork, and beef industries. This issue is complex, however. Recent years have generally been high-profit years for poultry growers (.pdf) -- a key piece of context that readers of Khan's article might miss. In particular, for the industrial-scale poultry producers who get contracts with the big processors, both farm income and household income are comparatively good on average. Certainly, I lose more sleep over poverty among hired farm workers in the poultry sheds than among poultry business owners! Furthermore, many economists are instinctively reluctant to have government agencies write rules for questions as difficult and complex as poultry production methods and pricing. Tina Saitone and incoming AAEA President Richard Sexton argue that contracts offer some efficiencies and benefits for consumers and farmers alike. In my view, not all contracts are bad, but some contracts may be abusive and anti-competitive. Even if you take the economists' view on this issue, there still is an important role for government reform. In particular, it is essential for contract terms to be transparent, so that farmers are not trapped into contracts with a single processor because they cannot find out their competitive alternatives. For this reason, when USDA retreated on its proposed contract reforms, one of the passages I read most closely had to do with the transparency of contracts. Under pressure from Congress, USDA backed down on a simple and entirely sound proposal to require processors to publish sample contracts. Buried deep in the Federal Register notice (.pdf) where USDA explained its revisions to the rule, a careful reader may find that the USDA officials themselves seemed to recognize that this would have been a good provision, and they sound disappointed that they had to back down. Livestock and Poultry Contracts Section 201.213 of the proposed rule required the submission and potential publication of sample contracts. Most supporting comments stated that implementation of this rule would assure fairness and market transparency which would allow farmers and ranchers the opportunity to make informed decisions, it would promote fair competition, and it would allow efficient and evenhanded enforcement of the P&S Act. Some comments expressed concern with the lack of clarity and the ambiguity of this section of the proposed rule. During a period of time when food policy-making at the federal level seems nearly dysfunctional -- witness the continued absence of a farm bill! -- I have been reflecting on innovations in the private sector and in civil society. Mark your calendar! From December 7 – 9, Food+Tech Connect, GRACE Communications and Applegate are bringing together technologists, entrepreneurs, creatives, policy experts, non-profit leaders and industry executives for Hack//Meat, the first-ever “meat hackathon” in New York City. Production: Develop tools to help small and medium sized ranchers more efficiently and sustainably manage their herds, process their meat and sell direct to consumers or wholesale buyers. Health: Reimagine how technology can eliminate or minimize antibiotic use and improve animal health. Processing: Design ways for processors to more easily demonstrate that they are complying with federal regulations, manage processing demand and access financing. Distribution: Streamline the process of selling “non-choice” cuts of meat, and improve the efficiency and financial viability of getting meat from farm to buyer. Foodservice: Make it easier and more affordable for restaurants and foodservice to source sustainable ingredients, as well as to manage supplier adherence to worker and animal welfare. Consumption: Improve consumer insight research and education on the benefits of sustainable meat and nose-to-tail cooking. Developers, designers, gamers, marketers, storytellers, academics, farmers, butchers, restaurateurs, policy experts and anyone who is in the business of meat is invited to participate. As always, you can be sure to expect great food, lots of learning and invaluable new connections. We also want to make sure teams are able to actualize your prototypes, so we’re offering cash prizes and consulting services to winning hacks. 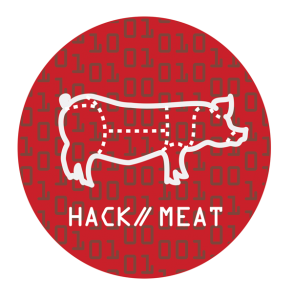 Visit the Hack//Meat website to learn more about the event and for updates on additional prizes and judges. You can register for the event here. A Choices Magazine theme issue released today explores the economics of food deserts. Guest editors Dave D. Weatherspoon, Shelly Ver Ploeg, and Paula Dutko provide the theme overview and links to four more articles. Weatherspoon and colleagues use data from a natural experiment, when a new retailer set up shop in a low-income neighborhood of Detroit. Tatiana Andreyeva suggests that WIC's new fruit and vegetable vouchers may have improved the healthfulness of local food retail in Connecticut. Dutko reviews the economic disadvantages observed in food deserts. And Alessandro Bonanno's article stands out for its attention to the economics of food retail supply as well as consumer needs. Attention to both need and supply is essential for people who want to think sharply about the food retail improvements that are truly feasible, not merely wishful thinking. Are Taubes and Couzens too hard on the Dietary Guidelines? Gary Taubes and Cristin Kearns Couzens have a remarkable expose in Mother Jones of the sugar industry's misleading public information efforts over several decades. The feature article stands out for its effective use of previously overlooked archival materials. The indictment of sugar industry influence on policy advice and nutrition science research is devastating. Everybody interested in U.S. food policy should read this story. I do have one substantial complaint. As in previous work by Taubes, this article does well in describing sugar industry public information campaigns, but it unfairly characterizes the recent editions of the Dietary Guidelines for Americans. One of the best things about the 2010 Dietary Guidelines, for example, is that any reader can see the systematic evidence reviews -- published free on the internet -- that form the basis for the document's conclusions. The authors of the 2010 USDA dietary guidelines, for instance, cited two scientific reviews as evidence that sugary drinks don't make adults fat. The first was written by Sigrid Gibson, a nutrition consultant whose clients included the Sugar Bureau (England's version of the Sugar Association) and the World Sugar Research Organization (formerly the ISRF). The second review was authored by Carrie Ruxton, who served as research manager of the Sugar Bureau from 1995 to 2000. Conclusion. A moderate body of epidemiologic evidence suggests that greater consumption of sugar-sweetened beverages is associated with increased body weight in adults. Taubes and Couzens say USDA cited "two scientific reviews," but anybody following the link can see that USDA cited four reviews. The review that USDA gives most weight was not mentioned by Taubes and Couzens, and it endorses the warnings against sugary drinks. The whole advantage of systematic evidence reviews is to avoid cherry-picking evidence that favors one's own argument. I think it would be great for science journalists to adopt the same practice of specifying a selection protocol in advance, just as the federal government's evidence reviews do, so that the journalists are not tempted to report only evidence that corroborates their thesis. Taubes and Couzens seem right on target in their criticism of the Sugar Association but quite unfair to the federal government and recent editions of the Dietary Guidelines. (The authors' criticism of earlier editions may be more justified.) Part of the reason I accept the main thrust of Taubes' critique of sugar-sweetened beverages is that -- despite his tone -- this particular aspect of Taubes' work seems fairly consistent with the sober judgement of mainstream dietary guidance in 2010. USDA's Food Safety Inspection Service (FSIS) this week began posting more information than ever before about foreign food safety audits. During the Bush administration, in-country audits generally happened annually, but, according to data provided to Food Safety News by FSIS earlier this month (which were posted online Wednesday), the number of in-country audits has dropped dramatically under the Obama administration. Online documents show that from 2001 to 2008 FSIS inspectors were routinely evaluating, in-person, the foreign plants processing meat for American consumers. The number of countries audited annually, with only one exception (in 2006 there was a large drop in audits), was between 25 and 32, so FSIS was auditing an average of 26.4 countries per year. From 2009 to 2012, however, the number of countries audited annually dropped to between 3 and 20, so FSIS was auditing an average of 9.8 countries per year. Food Safety News has released an interactive illustration of the data. Hover over a particular year to see the countries audited that year.